External ear - Visual Dictionary - Copyright © 2005-2016 - All rights reserved. [img]https://infovisual.info//storage/app/media/03/img_en/048 External ear.jpg[/img] [url=https://infovisual.info/en][/url] - [url=http://www.infovisual.info/]Visual Dictionary[/url] - Copyright © 2005-2016 - All rights reserved. External ear: one of two organs of hearing on the sides of the head, comprised of internal and external parts. 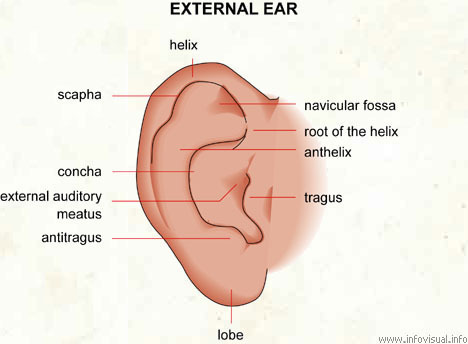 Helix: fold surrounding the auricle. Navicular fossa: boat-shaped fold of the ear. Root of the helix: part of the helix. Anthelix: curved ridge in front of the helix. Tragus: prominence over and in front of the acoustic meatus. Lobe: fleshy part at the base of the ear. Antitragus: ear projection opposite the tragus. External auditory meatus: mouth of the canal of the temporal bone that carries sounds to the eardrum. Concha: deep fossa of the external ear. Scapha: hollow at the end of the helix. The ear is the sense organ that detects sounds. The vertebrate ear shows a common biology from fish to humans, with variations in structure according to order and species. It not only acts as a receiver for sound, but plays a major role in the sense of balance and body position.